If you dreamed a dream that fried food would one day be healthy and prevent cancer and stuff, well then, unlike Fantine's dream in Les Miserable, your dream just came true. Sort of. While fried Twinkies remain terrible for you, a new study shows that frying vegetables is good for you. In fact, it's healthier than the alternative of boiling them in water. To conduct this study, researchers from the University of Granada in Spain looked at vegetables kept in "optimal conditions" and tried cooking them using three different techniques: frying them using olive oil, boiling vegetables in a mixture of water and olive oil, and boiling vegetables in just water. 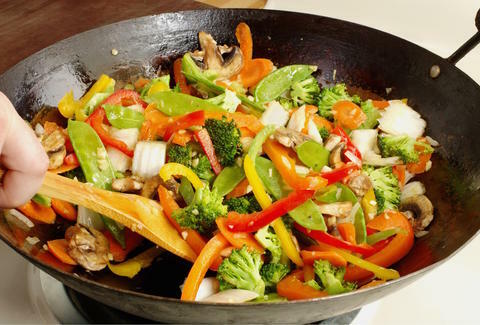 The results show that frying vegetables in olive oil may be the healthiest route, as this increases "phenols," which are compounds that can actually prevent cancer, diabetes, and macular degeneration. All good things. One of the study's authors, Cristina Samaniego Sánchez, had this to say on the results, "While comparing the total phenol contents of the fresh vegetables, we found both increases and decreases in their levels, depending on the cooking method employed. As a heat transfer medium, the EVOO increases the amount of phenols in the vegetables, in contrast with other methods such as boiling, which use a water-based heat transfer medium." However, study authors also noted that the absorption of all that olive oil does amount to more calories being consumed. So, this is not the low fat way to go. Also, remember, this all has to do with frying things in olive oil, which contains phenols. Frying your vegetables with butter will not produce the same results, obviously. All in all it's a good day for fried foods. Maybe someone will discover that fried Twinkies are also good. OK, fine. That's a dream that will remain a dream. But it can't hurt to dream. Kara King is a News Writer at Thrillist and puts olive oil on everything. Send news tips to news@thrillist.com and follow her at @karatillie.